VtW ShowX Live Interview Tomorrow! Want to hear more about my new book releases? Want to see what they look like? Want to just kick back and relax and join us for some fun chat? Check out VtW Production’s ShowX tomorrow! Beck and I will be guests on Wayne and Ken’s show tomorrow start at noon Mountain Standard Time! The show has a new live stream location, through Twitch, so be sure to click the link below to find your way there! Hope to see you all on the channel! If any of you went looking for the print editions of my new novels, you may have had difficulties during certain times…Amazon KDP was extremely delayed and kept encountering issues in which the books disappeared from amazon.com and then reappeared later. They’re finally settled in, and available for purchase along with the Kindle editions! And if you want both, be sure to buy the print edition first, as you then get a significant discount on the kindle edition! The Sword of Dragons Triple Book Release Today! Hi everyone, it’s here!! The day has arrived, and three books in the Sword of Dragons series are available in print and Kindle! :D Click the covers below or the links beneath them to go to their store pages! 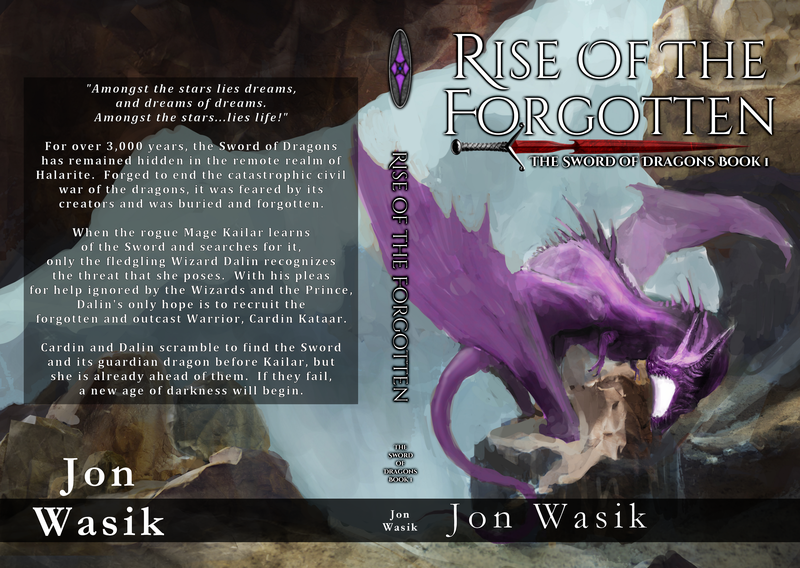 Click here for Rise of the Forgotten in print! Click here for The Orc War Campaigns in Print! 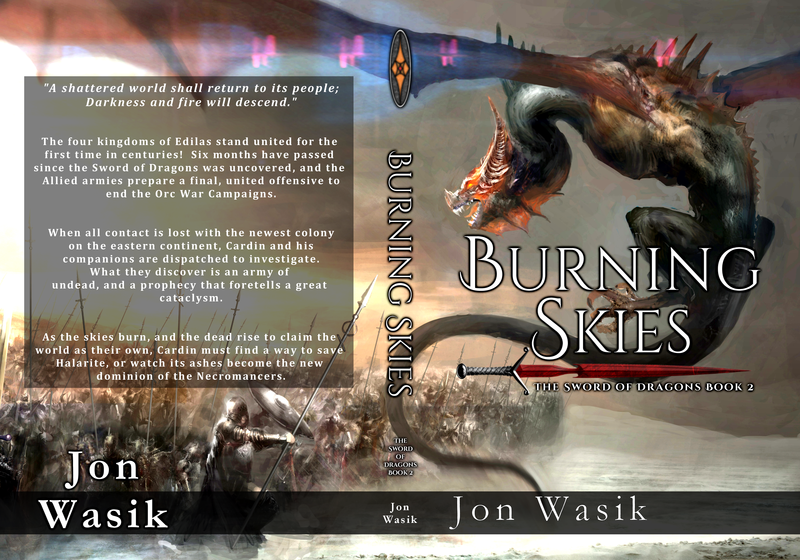 Click here for Burning Skies in print! There’s more to come, including an interview on Show-X this coming Sunday. Check back here again tomorrow for details! 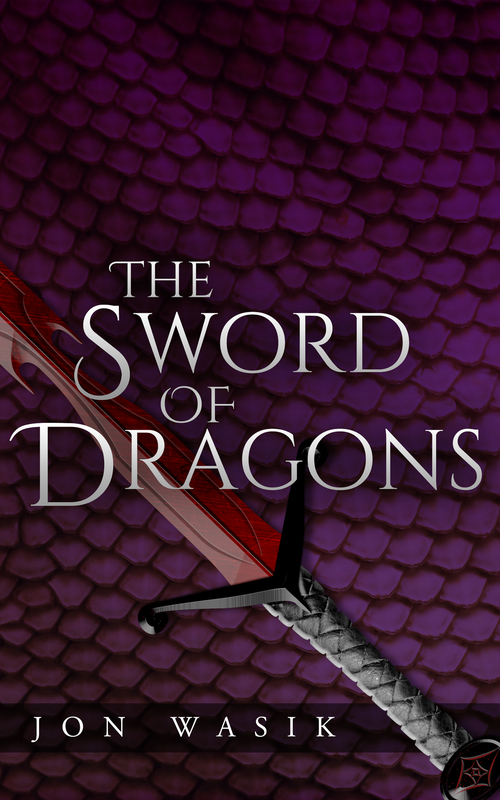 The Sword of Dragons – 2nd Edition Cover Reveal! Hi everyone, today is gonna be one jam-packed blog! It’s been over a year in the making, but the 2nd editions of the first two novels in the Sword of Dragons series, along with the print edition of the Orc War Campaigns anthology, finally have a release date! This also means that I finally show off the covers! If you’re new to my blog, a long time ago I announced that I was working towards this goal. 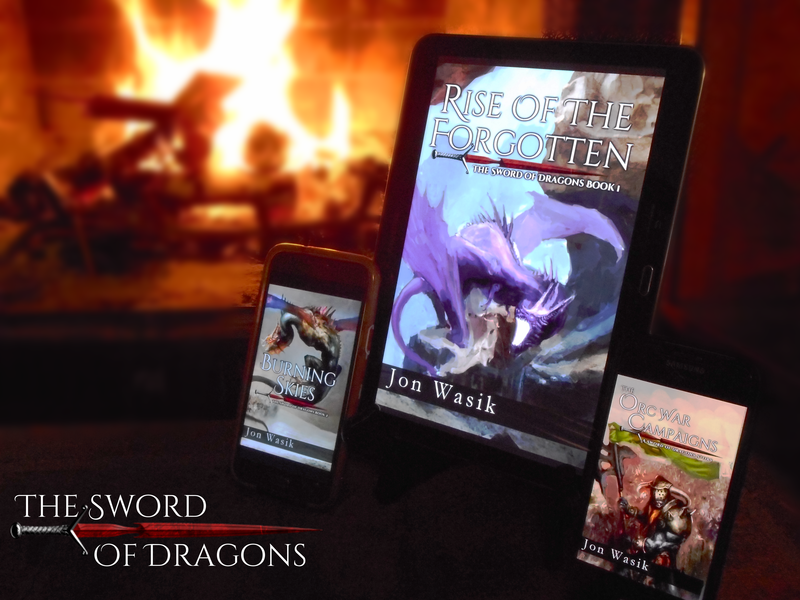 One of the many changes in the 2nd edition was a unique title for the first book, previously just titled “The Sword of Dragons.” Now it is known as “Rise of the Forgotten”! 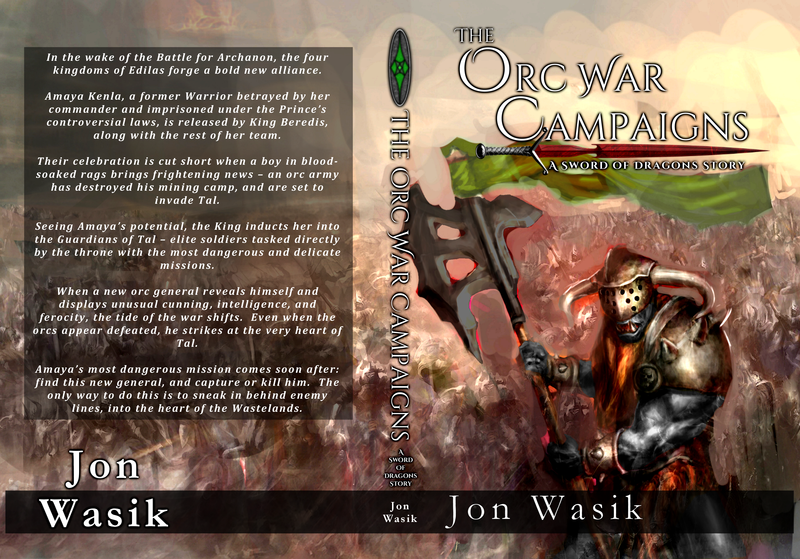 The Orc War Campaigns Full Cover! Artwork by Vuk Kostic. I am very happy to have spent the money to purchase the rights to utilize his artwork, and at least for the time being, I plan to utilize his artwork for all future Sword of Dragons covers. I highly recommend checking out his Shutterstock page to see what else he has, he’s a fantastic artist! Not to mention maps! There are maps inside the books!!! Even better news, I’ve officially settled on a release date for all three books…and it’s just around the corner! Drum roll, please…. Yup, you read that correctly, this coming Friday! In fact, as soon as Amazon approves everything, the Kindle editions will be available for pre-order! I’ll update my facebook author’s page as soon as I get notification with links to where you can go to pre-order! Unfortunately KDP has no method for allowing pre-orders of the print editions, but fear not! As soon as I possibly can, this Friday I will post links to them once they are available! I want to thank all of you, my readers, my fans, everyone. This has been a tremendous effort that has been on top of considerable life changes. Since I began this undertaking, I lost my Mom, married my wonderful Starshine, and moved. Through it all, I’ve received nothing but encouragement and support from everyone. It means the world to me. I hope you all feel like this was worth it, and I hope you enjoy. I look forward to hearing what everyone has to say about them!! 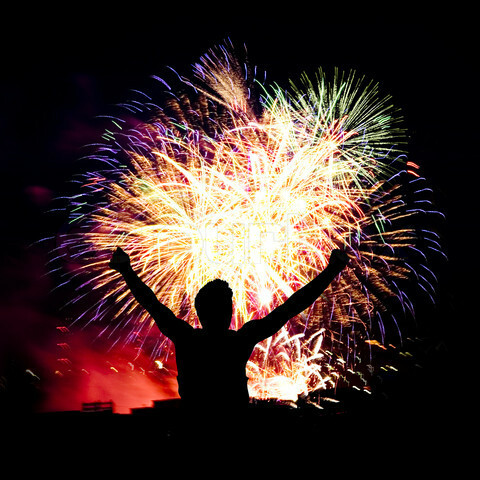 So It Begins – Return of the Author! I’m back! …….I know, I know, it’s been a long time. I’m so sorry! I don’t usually like making excuses, but I feel like I owe at least a quick explanation. It boils down to life being busy and the need to work on writing, or more to the point, proofreading and editing. I know that writing a blog doesn’t take a long, long time out of each week, but given how little time I’ve had to work on anything writing related, those extra minutes or couple of hours have been precious. But it was well worth it. Because three novels will be available very soon! I’ve finished all proofreading and editing on all three novels, gotten two proof copies (and found changes needed on the covers,) and now ordered what I hope will be the final proof copies of all three novels! What that means is cover reveals may finally be coming! Hopefully as soon as next weekend!!!! Having said all of that, I wanted to get back a little bit to this blog’s roots and talk about some of what I’ve learned these past few months about my writing style, and the changes I’ve noticed. Editing these three books has been a unique and eye-opening experience, because each of these three were written several years apart! Rise of the Forgotten was written over the course of several, several years, and I believe the first ‘final’ draft was completed in 2013 or so. 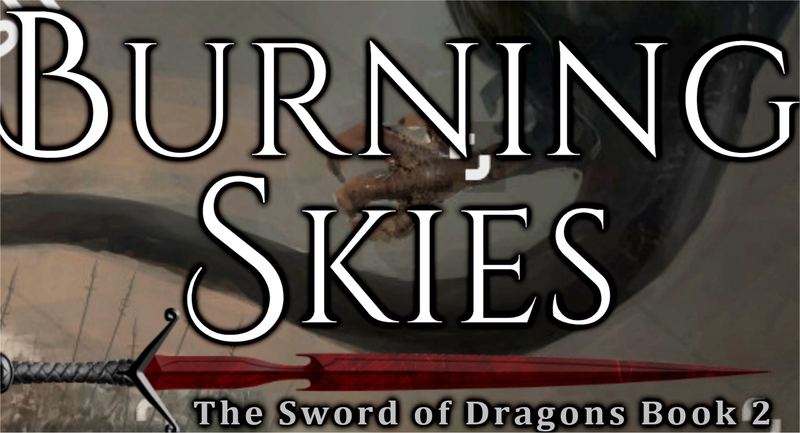 Burning Skies was finished I think around 2014, and then Orc War Campaigns in 2016. I also cut a lot back. 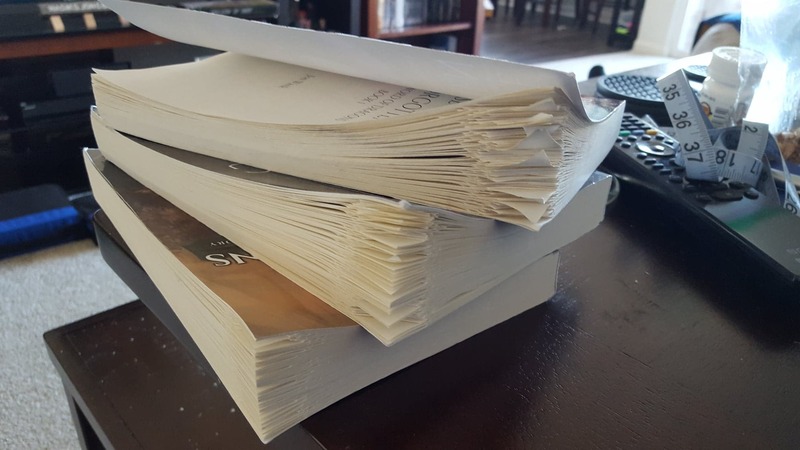 In fact, in both books 1 and 2, I completely cut out entire paragraphs, because they were completely useless paragraphs and they only slowed the story down! Changing “Cardin began to move” to something as simple as “Cardin moved” or even better, “Cardin ambled over.” Word choice that moves the story forward actively rather than ‘starts to’ move the story forward but doesn’t actually do it. That’s all I have for today, folks! Check back next weekend for news on the new books, including hopefully cover reveals and, if all goes well, release dates! When Is It Time For A Cover Reveal? …but is it too soon to do that? I honestly wasn’t sure what might be appropriate from a marketing point of view, so I decided to hit the search engines and start reading articles. And pretty much immediately, the consensus was clear: not until your book is ready for pre-orders. I’ve already done a partial reveal with the text on the titles, and I’ve received proof copies of Rise of the Forgotten and Burning Skies, both of which revealed a couple minor tweaks that are needed (and already fixed on the digital files.) But should I wait for a complete reveal? I think it makes sense to an extent. That first impression can come with a buy impulse for a reader. “That looks cool, I wanna buy that!” So pre-orders would hopefully mount up. Where as if I revealed the cover now, but pre-orders weren’t ready for another 4 or 5 months, people’s initial excitement might be long lost and pre-orders might be less than stellar. So for the moment, I’m going to hold off on the cover reveal. I want this release to be done right. I want to learn from the mistakes I made in the past. And I want to give my readers the best experience that I can. 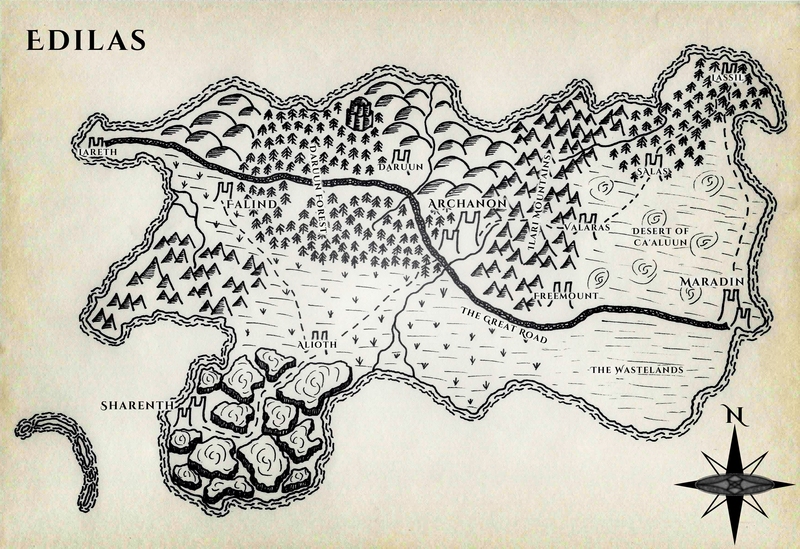 What I can say is that I’m still strongly thinking about a pre-order bundle somehow that will include all 3 books (Rise of the Forgotten, Burning Skies, and The Orc War Campaigns) as well as a printed map, either of Edilas or of all of Halarite. I’ve recently done just a test print on an 8.5×11 paper with an aged parchment effect, and I like it! If a print service can do this larger, and on the right kind of paper, this would definitely make for a neat extra to throw in with pre-orders! The only challenge I’m running into right now is a platform to sell the bundle through. Etsy is a no-go because they only allow the sale of hand-crafted items, not printed books. So I need to find a venue appropriate to such a sale, and eBay doesn’t strike me as appropriate. Does anyone out there have any suggestions? Before I sign off, I wanted to say thank you to everyone who gave me words of support last month after my Mother passed away. You words warmed my heart. :) I went nearly a month without a new blog, but I’ve still been seeing visits, comments, and likes on past blogs, and I’m grateful to everyone. After two years in a row of publishing, 2017 was the first year where I didn’t publish a single new novel. And for much of the 2nd half of 2017, that meant depression for me…I already had a plan moving forward for my writing career, but I knew nothing would be ready for publication in ’17. However, a recent article I’ve read by another author has reminded me that there’s something more important than pumping out novel after novel like a factory. Writing is an artisan career, and sustainable writing is more important than mass production. But I want to spend an entire blog writing more on that. For now, let me just pass on the word – you don’t have to write 20 novels a year to be a successful author. That leads to burn out. Just do the best you can, and don’t forget to live a little. On the bright side, I have made considerable headway this year, especially in the 2nd half, towards the 2nd editions of the Sword of Dragons books 1 and 2, as well as finally getting the Orc War Campaigns anthology ready for print! I’ve learned a lot about the market, far more than I ever anticipated, and I think I’m a little more prepared to move forward in my writing career in 2018. One of the greatest highlights of ’17 was the day I proposed to my beautiful Starshine, Beck Stewart! Since that day, we have moved in together and begun living and planning our lives together. 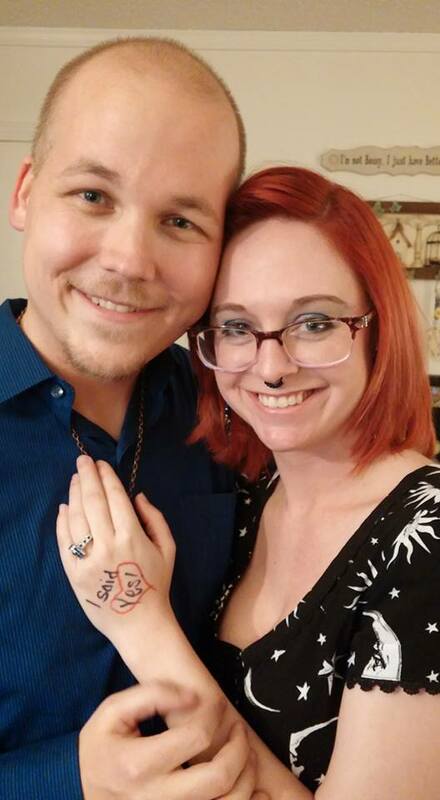 After more than a year together, and nearly a year engaged, I am happier than I ever thought possible with my relationship. Fellow author, artist, geek, and weird like me ;) She has been my rock, my muse, my voice of reason. She’s helped me keep the demons back, helped my writing move forward, and encouraged me every single day. Thank you, Moon of my Life! 2018 – Three Books At Once?! With everything I have learned about writing, marketing, and cover art, I came to a decision in the last couple months: when I release the 2nd editions of the Sword of Dragons books, I plan to release them together, along with the Orc War Campaigns anthology. That’s right, 3 books at one time! As crazy as it sounds, it’s actually not a stretch, and in fact gives me the time I need to get everything prepared, and actually make the books look like they belong together, both with their covers and their interiors. In fact, as of tomorrow, I’ll have finished editing Burning Skies! At least, until I read through the proof copy. I’m sure I’ll find more to fix with that. But that’s my system – I have a proof of Rise of the Forgotten, and when I finish editing Burning Skies, I’ll order that proof while moving on to The Orc War Campaigns. Once I finish that and order its proof, I’ll go back and read through Rise of the Forgotten’s proof copy, and so on. When will these three be released? I don’t know yet. But I’m working quickly. The Year I Get Married! The first half of 2018 is going to be busy for another reason – my marriage is coming up fast! And that means more and more of my time outside of work will need to be devoted to preparations. I’m hoping I get proof copies of all 3 books before then, but I’m not going to rush. That’s a difficult lesson 2016 and 2017 have taught me – rushing stories out isn’t the best idea. Working under a deadline is one thing, but as I mentioned before, sustainable writing is more important. I don’t want to burn myself out. Thank you to everyone who visited in 2017! Much to my surprise, my blog has received more new followers and views this year than in 2016, and I’m so glad you all have found your way here!